Si6O18(OH)4. This sample is from Brazil and is described as elbaite with albite. It is a silicate which has lithium content, lithium being a rather rare element. It also contains boron This sample is about 10cm across. 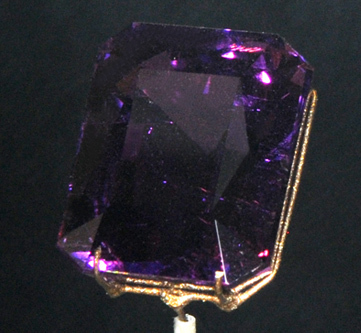 Elbaite is named after the area of the Island of Elba, Italy. 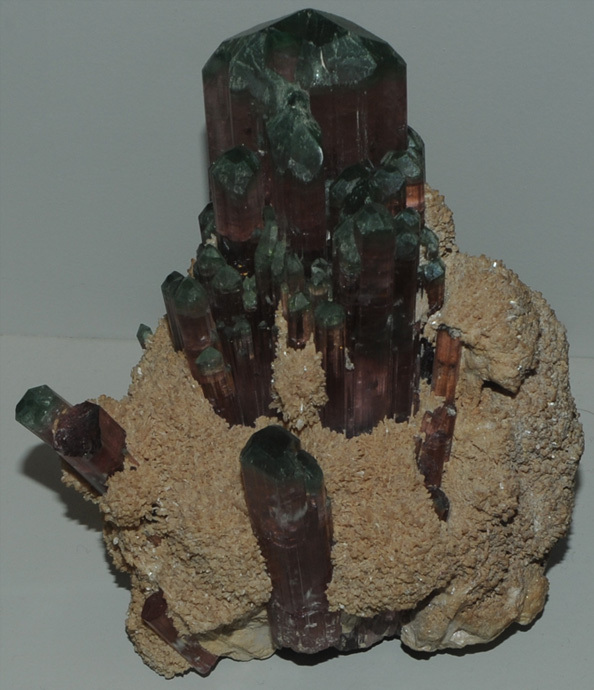 Elbaite is a member of the tourmaline family. This magnificent sample of elbaite with albite and quartz is from the Tourmaline Queen mine, San Diego County, California. It is about 25 cm wide. 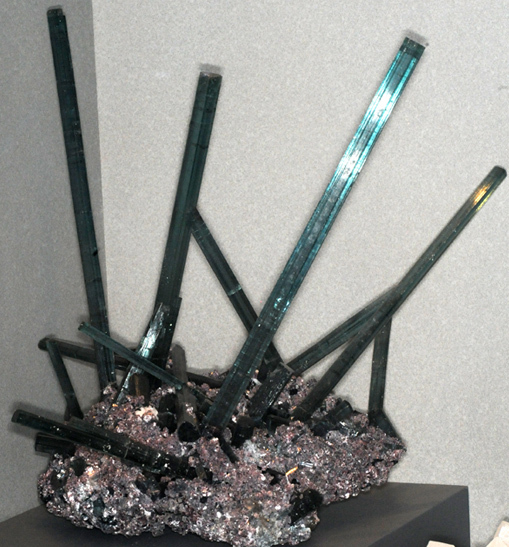 As the elbaite crystals grew, the growth solution changed from manganese-rich to iron-rich, creating a blue top on each "candle" (This sample is nicknamed "Candelabra"). At right is elbaite with albite from Golconda mine, Governador Valadares, Minas Gerais, Brazil. It is about 12 cm across at the base. The column is about 3x20 cm and is from Salinas, Minas Gerais, Brazil. 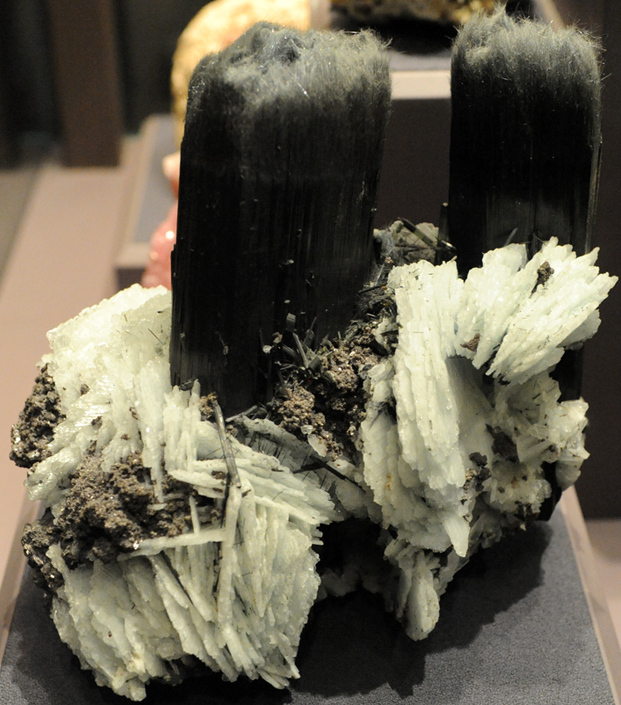 Another example of elbaite with albite and quartz in the column structures. This sample is from Little Three mine, Ramona, California and is about 18 cm across at the base. This is a 50.5 carat elbaite gem of variety rubellite from Minas Gerais, Brazil. It is set with diamonds. The column of elbaite at right is from Nevel gem pit, Newry, Maine. It is about 10cm wide by 30cm high. Above left is an elbaite column of variety indicolite from Mt. Mica, Paris, Maine along with a 21.1 carat gem. The column is about 1.5x6cm. Center is a 30.4 carat elbaite gem from Nevel gem pit, Newry, Maine. At right above is a 20.4 carat gem from Madagascar. 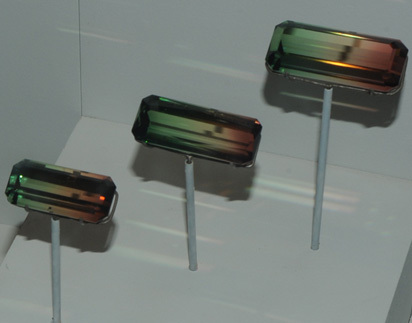 The first American tourmalines (elbaite) were discovered and mined in Maine. Maine has been a source for green elbaite. 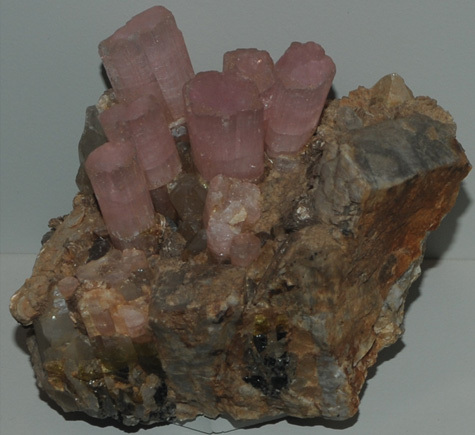 Currently the major U.S. source of elbaite, especially pink elbaite, is San Diego County, California. This elbaite sample is from Santa Rosa mine, Minas Gerais, Brazil and is about 8-10 cm at its base. It shows the kind of progession in color that can occur with crystal growth in elbaite. 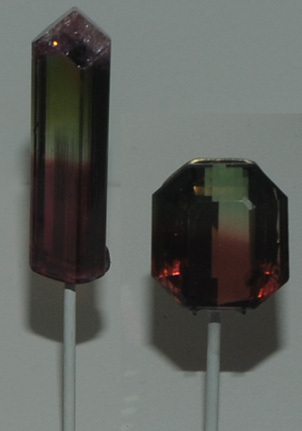 This set of elbaite gems is titled "Bicolor Tourmaline Trio" with gems of 60.73, 75.24 and 90.03 carats. They are from Mozambique. 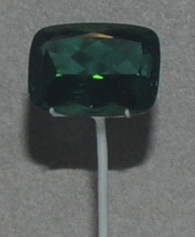 Above is a small column with color variation and a 34.6 carat gem made from the same material from Minas Gerais, Brazil. They are to the same scale. 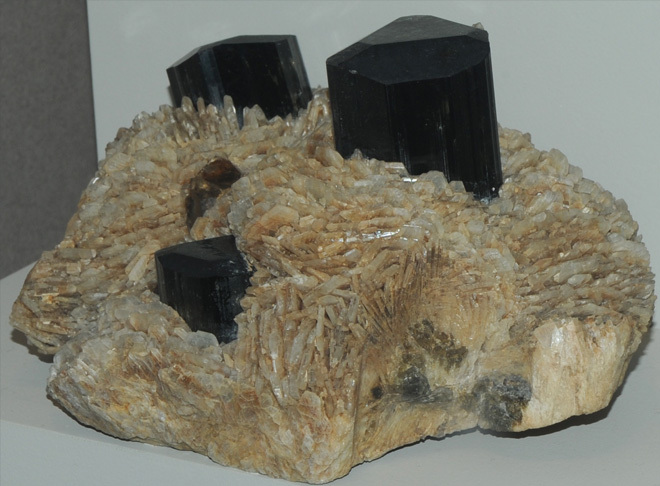 This mineral sample is elbaite with schorl and quartz. It is from Elba, Toscana, Italy and is about 10 cm across. The branched column at left is from Jonas mine, Itatiaia, Minas Gerais, Brazil. 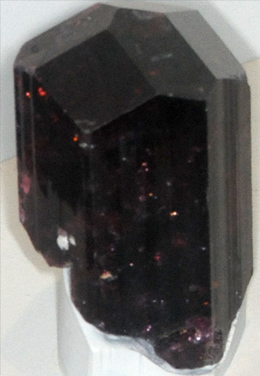 It is elbaite of the variety rubellite. 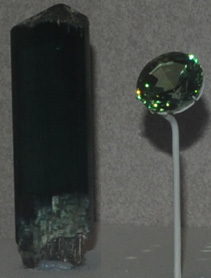 The center speciment is a short column of about 10 cm diameter and at right is a 15.9 carat gem from Madagascar. They are all at the same scale. This elbaite sample at right is about 8cm across and is accompanied by a 17.7 carat gem. It is from Elba, Toscana, Italy. 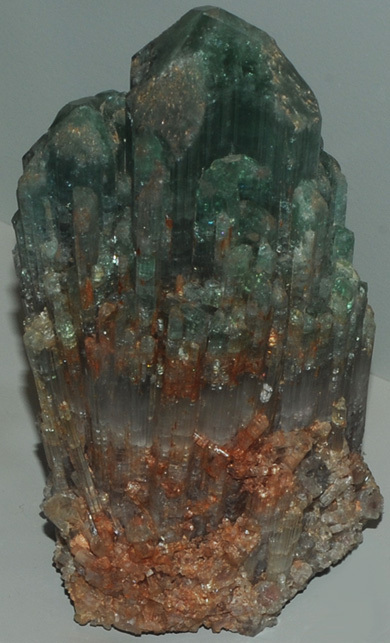 The column crystal above is about 10cm high and is from Nepal. 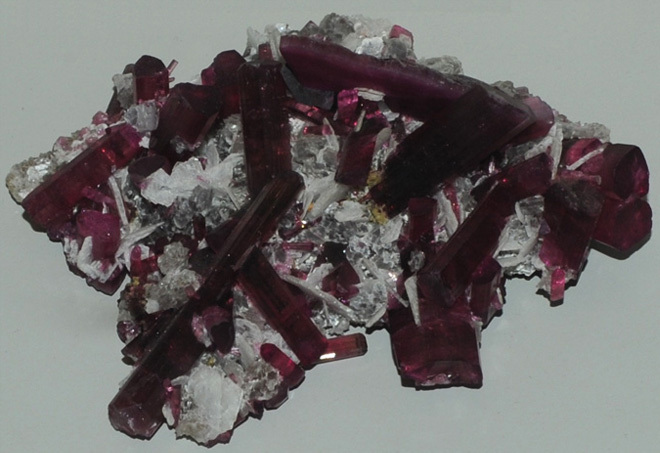 At left above are two elbaite gems of the variety rubellite. They are 62.4 and 40.2 carats and are from Minas Gerais, Brazil. Next is elbaite of variety achroite. The gem is 31.9 carats and is from Nuristan, Afghanistan. Next is another elbaite gem of variety rubellite. It is set with diamond. It is 50.5 carats and is from Minas Gerais, Brazil. Next is another rubellite gem of lighter color at 100.4 carats from Stewart mine, Pala, California. At far right the green elbaite gems are 109.6 and 117.6 carats from Minas Gerais, Brazil. The column of elbaite at left is about 6 cm in diameter. Above, the green column is about 8-10cm in diameter and is from Minas Gerais, Brazil. It is elbaite with quartz. The two gems at left above are of the variety rubellite and are 18.4 and 58.5 carats. They are from Mt. Mica, Paris, Maine. The green gem is 48.7 carats and is from Nevel gem pit, Newry, Maine. 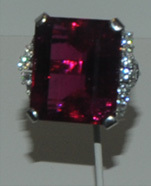 The right gem is elbaite of the rubellite variety. It is 37.8 carats and is from Tourmaline Queen mine, Pala, California. 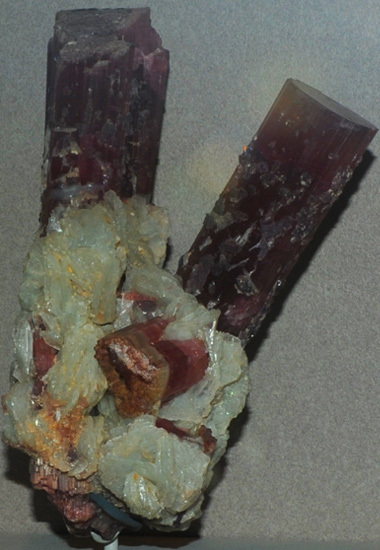 The twin column at left is elbaite of variety rubellite and is formed with albite. 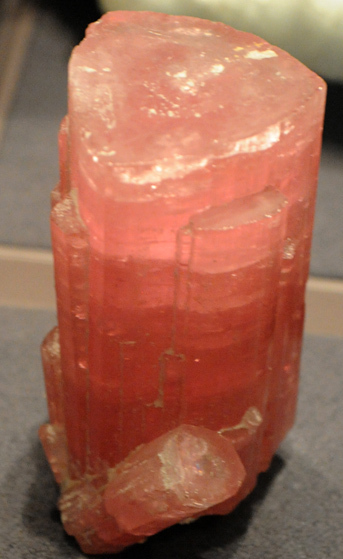 It stands about 20 cm high and is from Himalaya mine, Mesa Grande, California. The elbaite gem above left is 48 carats and is from Tourmaline queen mine, Pala, California. The two elbaite samples above right are 151.2 and 44.2 carats and are from Nevel gem pit, Newry, Maine. 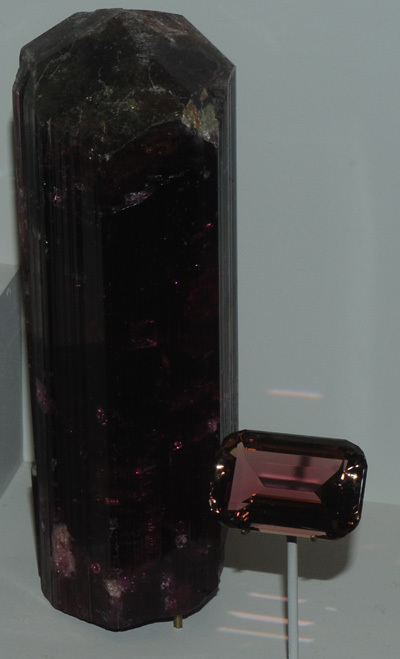 The elbaite gem above left is 40.3 carats and is from Tanzania. The next gem is of variety indicolite and is 25.5 carats. It is from Minas Gerais, Brazil. The two gems at right above are 46 and 71.1 carats and are from Nuristan, Afghanistan. 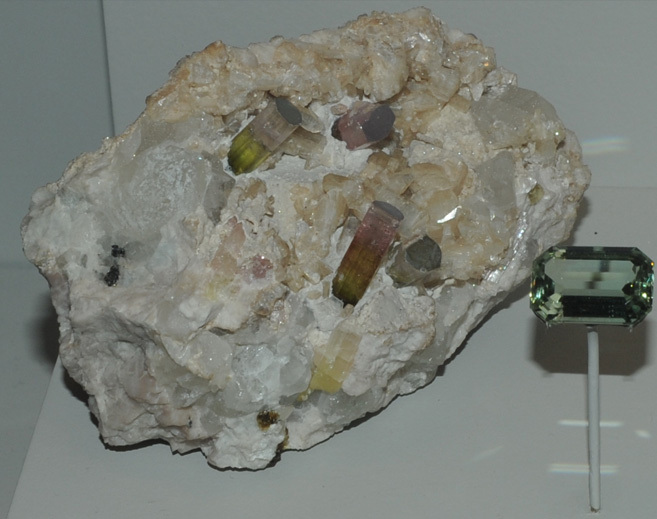 The large sample at right is elbaite of variety verdelite. 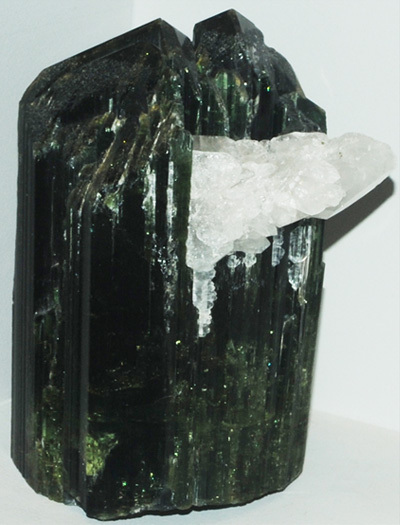 It is about 12 x 30 cm and is from Santa Rosa mine, Minas, Gerais, Brazil. The sample above is elbaite with quartz and albite. It is about 10 cm across and is from Stak Nala, Gilgit, Northern Areas, Pakistan. 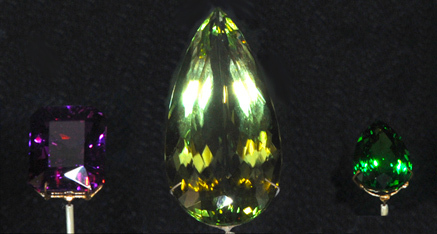 The 40.1 carat elbaite gem shown at right is from Mozambique as a part of a recent gem discovery with an unusual color for elbaite. 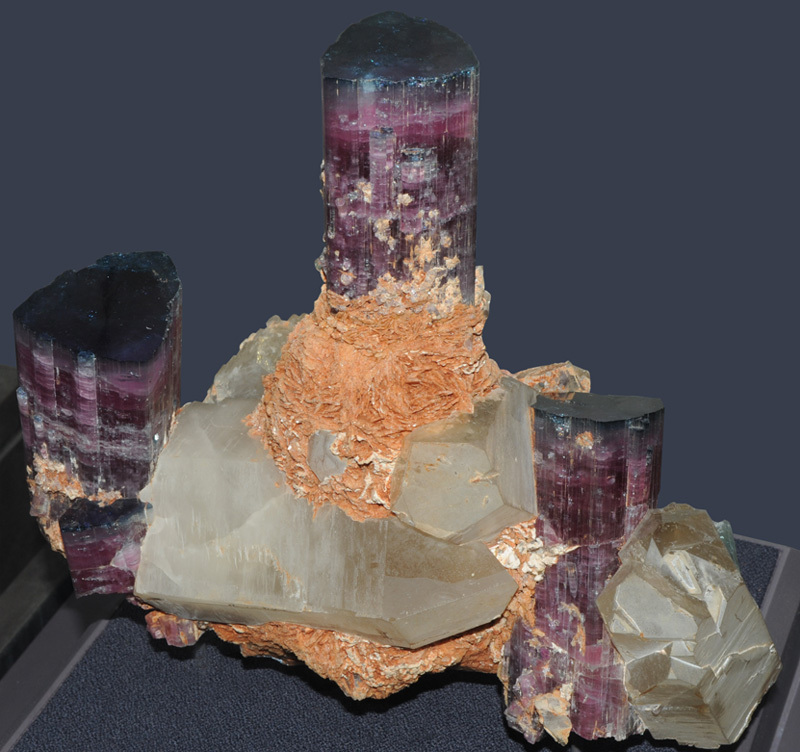 It is displayed at the Smithsonian as part of an extraordinary trio of gems. The center gem is hydroxyl-herderite , 161.08 carats, from Brazil, perhaps the finest gem of its kind with its size and deep green color. On the right of the gem trio is a 15.93 carat grossular gem of variety tsavorite from Kenya. 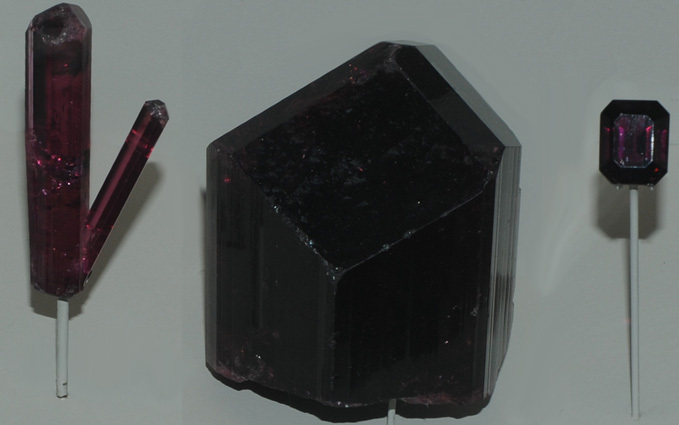 The elbaite sample at left is of variety rubellite from Nuristan, Afghanistan. It is about 5x12 cm. It's source is a pegmatite. This elbaite sample is about 5x7 cm and is from Anjanabonoina, Madagascar. The above sample of elbaite is about 30 cm in overall width and is from Pederneira mine, Minas Gerais, Brazil. It is described as elbaite with lepidolite. The sample below is described as elbaite with eosphorite. It is about 4x11 cm and is from Santa Rosa mine, Minas Gerais, Brasil. 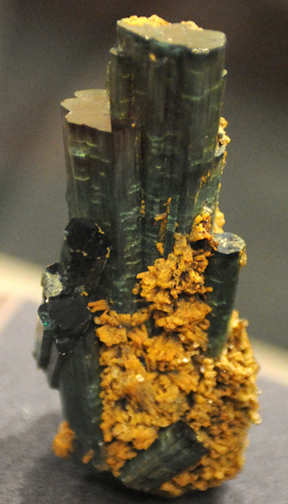 Blue-green elbaite, a member of the tourmaline family, is associated here with brown eosphorite. 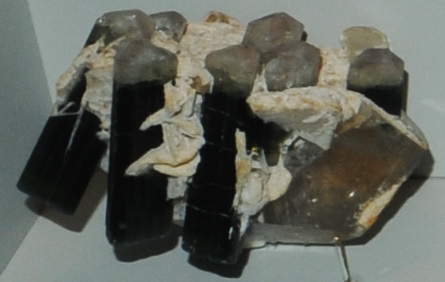 The grooves that run the length of the crystals are typical of tourmalines. 6.7 carats from Sao Jose de Batalha, Salvadinho, Paraiba, Brazil. This demonstration of the variety of gems available from elbaite is a gift to the Smithsonian by W. A. Roebling. The differences in color come from minor differences in trace impurities in the mineral.